Unbelievable value! 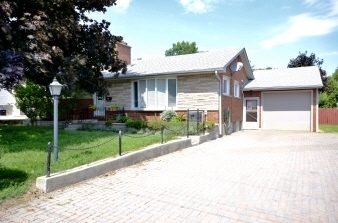 Situated on a large picturesque treed lot. This stunning one floor Ranch is ideal for the growing family & hobbyist. Newer updated Kitchen features granite countertops with island & build-in dishwasher. Spacious newer Bath with separate shower & jetted tub. From the Kitchen you have direct access to a very large main floor Family Room with features lots of natural light & is warmed by a gas fireplace. For the hobbyist there is a fabulous 15x40 combination Garage/Workshop. Also parking for 6 cars on the interlocking brick driveway. The Lower Level has a finished Rec Room and ideal office. Other features include new gas furnace, 2 fireplaces, 226 ft deep Rear Yard (ideal for vegetable garden), water heater is owned and much more. Living Room has gas fireplace and has been converted to the Master Bedroom but can easily be changed.